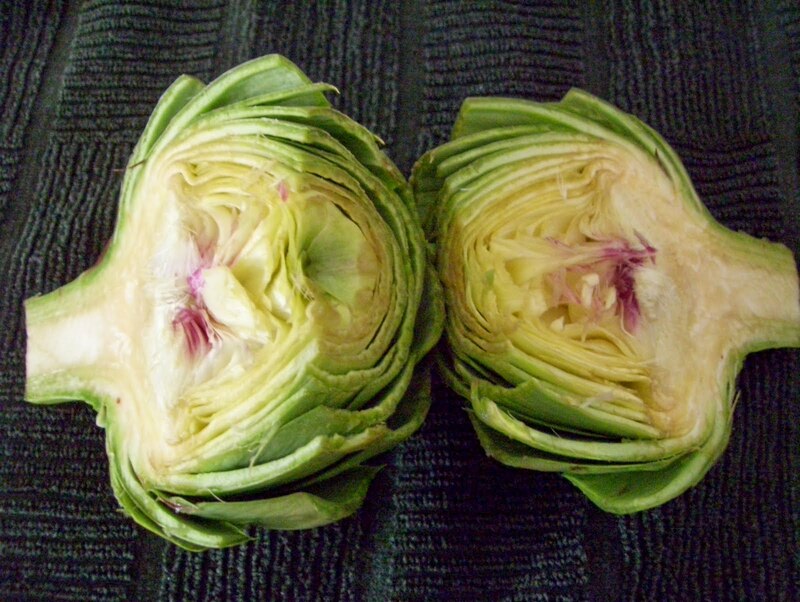 My dad's Italian heritage gave him the familiarity with artichokes that my mother's Iowa roots did not. Mother, however, had lived in Europe twice during WWII years when she worked for the government; that part of her life gave her a world of taste experiences that were reproduced in our home. Because of my parents' backgrounds, artichokes were often served in our home. We were taught how to pull the leaves off of the globe and how to dip them into lemon-butter. It was fairly easy to figure out how to gently scrape them through our teeth to remove the softened leaf pulp. The best part, however, was the flavorful and satisfying heart...but, the leaves and the fuzzy choke had to be dealt with first...so, it was almost a labor of love to finally reach that inner reward. A few years ago, we took a trip to California and eventually found ourselves in Monterey County where 80 percent of US artichokes are grown. We drove into Castroville which proclaims itself to be "The Artichoke Center of the World", and even holds an annual artichoke festival. I was fairly hopping up and down with anticipation as we drove by the signs and saw all the fields growing one of my favorite vegetables. 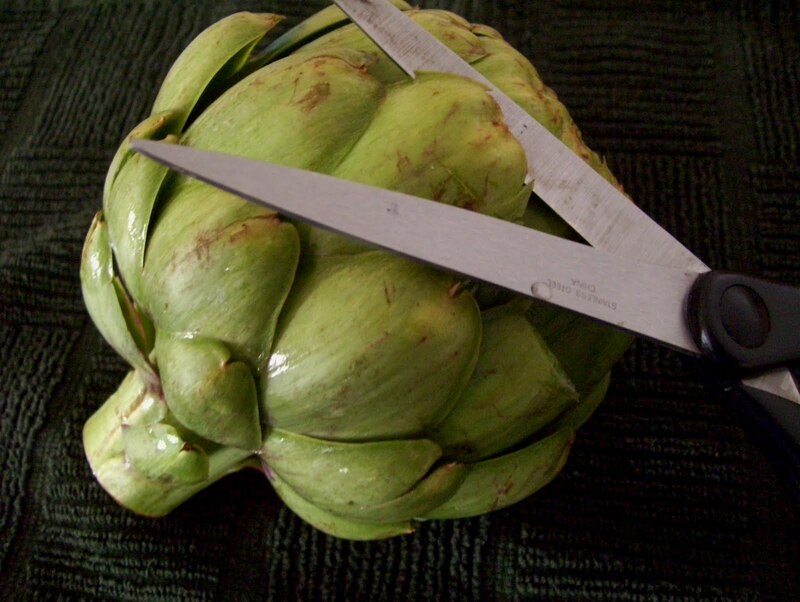 I ran into a roadside market only to find sad, old and costly artichokes for sale. A few more stops produced the same result...no large, fresh and economical artichokes were anywhere to be found. What a disappointment. No one could give me any information about fresh produce, so I left empty handed and very, very unhappy. 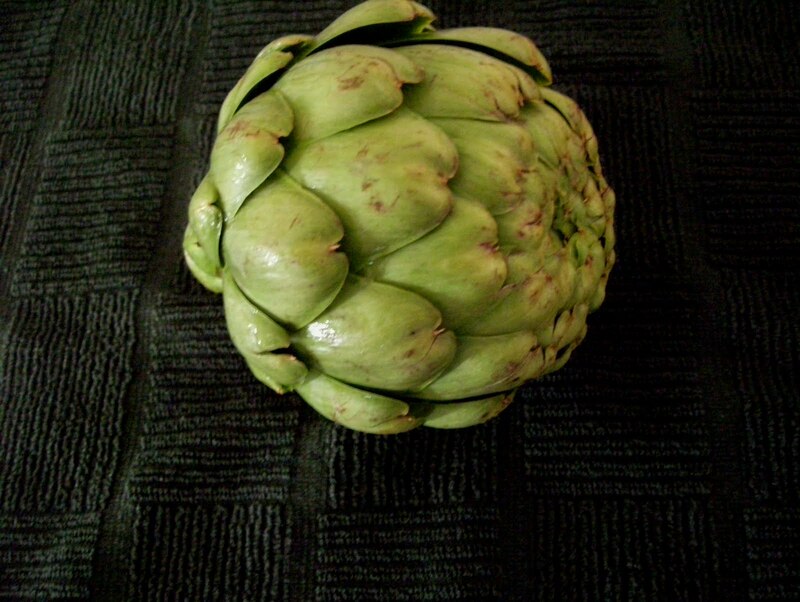 The Ozarks of Missouri, where I now live, has beautiful scenery and lakes, but definitely lacks food choices; therefore, I am always on the alert for big, fresh artichokes that are not outrageously priced. While this only happens two or three times a year, most often I have to be satisfied with canned, frozen or marinated hearts. 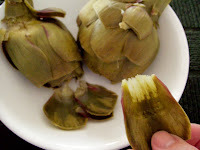 Luckily, my husband does not care for artichokes and I can, selfishly, eat all of them myself. 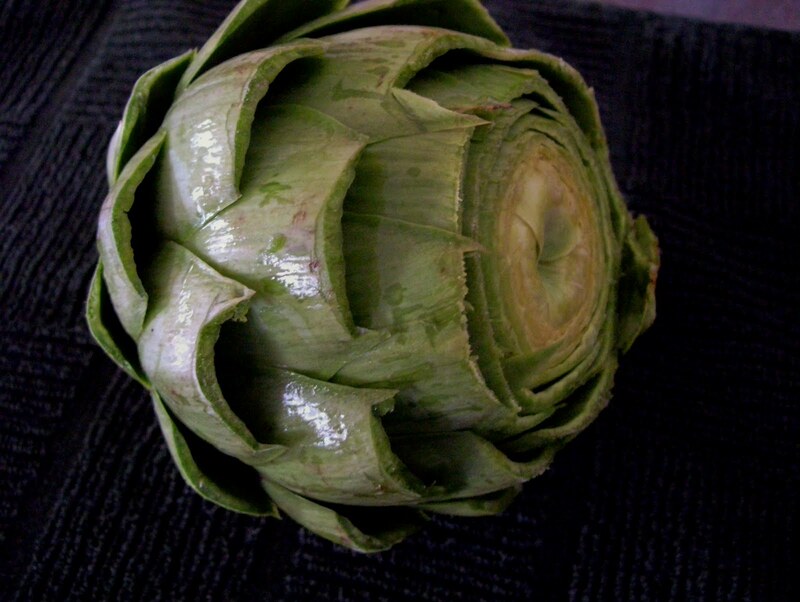 If you are adventurous and want to add a wonderful vegetable to your menu, please try an artichoke the next time you see a bright green, fresh looking one in your produce section. 1. Select only bright green globes. If they are wilted or brown, pass them by...those are old. 2. Trimming - The leaves have thorns on the ends and should be cut off with a scissors. The top end is also sliced off with a knife. The stem ends are trimmed with a knife. Some people remove the whole stem, but, I leave it on. 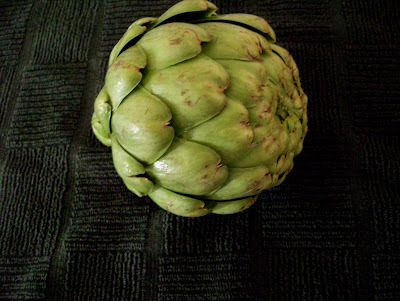 If the artichoke globe is very large, it may be sliced in half. Immediately immerse it in a pot of water that has had lemon juice added to it. This will prevent the cut edges from turning brown. 3. Cooking: Simmer in a pot of water. I always immerse the globes while some people add a few inches of water and a steamer basket and steam them. Which ever method used, they take around 35-45 min. to simmer or steam until the leaves are tender. Check for doneness by pulling one of the larger leaves off of the globe. If it is easy to remove, hold the cut end between your thumb and index finger and scrape the leaf between your front teeth; if the pulp scrapes off easily, the artichoke is done. 4. Serving: remove globes from the water with tongs and place in a strainer to drain off most of the water. I sometimes give them a little squeeze with the tongs to help this process along. Place globe or globe half on serving plate next to a little cup of half melted butter and half lemon juice. 5. Eating: starting at the stem end, pull on a leaf to remove it from the globe and dip it into the butter mixture. Continue holding the cut end of the leaf between your thumb and index finger with the outside of the leaf facing out. Put the leaf between your teeth so your fingers just touch the outside of your teeth. Close your teeth and gently pull the leaf out while scraping away the tender pulp from the bottom of the leaf with the bottom, front teeth. This tasty, buttery morsel is then swallowed and the procedure continues. The leaves become more tender as you reach the center and the ends may be bitten off without going through the scraping process. Some of the very small inner leaves are just discarded as they are thorny and not tender. 6. Heart: The last part is the most fun and rewarding. You will notice a fuzzy, inner core. It would cause you to choke if you ate it...hence the name...This choke material must be removed and it is easily pulled away from the heart. Use your fingers or a fork to gently pull it away and put it with the pile of scraped leaves. 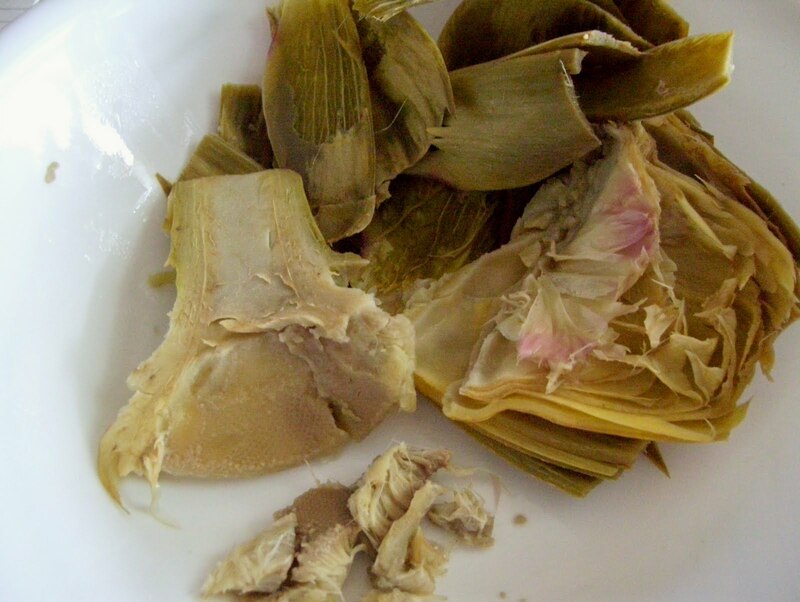 The remaining heart may be cut up or left whole. Dip the pieces in the butter/lemon mixture and savor each wonderful bite. I always eat the stem, although some people find it to be slightly bitter.